September 1957. Little Rock, Arkansas. All the "Little Rock Nine" wanted was the same high-quality education provided for white students at Little Rock Central High School. But when Carlotta, Minnijean, Melba, Terrence, Jefferson, Elizabeth, Gloria, Ernest, and Thelma tried to enter Central High School, something the Supreme Court had ruled they could do, they were met with angry mobs. People yelled insults at them, spit on them, and threw rocks at them. They were not able to enter the school that day. 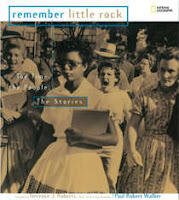 Remember Little Rock is the story of these nine students, their struggle for equality, and their incredible bravery in the face of stunningly violent protests. The book starts off with a bang, describing Elizabeth Eckford's first attempt at entering Central High School and the incredible scene that met her. Can you imagine facing so many people protesting against you? Can you imagine being at home and watching TV coverage of the riots surrounding your son or daughter? And it wasn't over after the first day. It took three weeks for the students to actually start their school year, and their battle wasn't over once they entered the doors. The Little Rock Nine still faced insults, prejudice, and abuse from students and teachers every day. Incredible archival photos accompany a readable text and illustrate this riveting event. The book includes a timeline of the Civil Rights movement, notes about each of the Little Rock Nine, a list of sources, and an extensive index. I'd highly recommend this book for units on civil rights. Pair it with Through My Eyes by Ruby Bridges and Warriors Don't Cry by Melba Pattillo Beals. Happy Nonfiction Monday! You'll find the roundup at Write About Now. Thank you for reviewing this book about my home state; I have forwarded your review to a number of people in Little Rock who worked to create the museum on the incident. Again, thank you! It's mind boggling to think of what these children and their families went through. Thank you for the review and book recommendations.